don’t tell the whole truth!Have a look at the picture to the right:It shows at first glance what appear to be a healthy set of teeth. 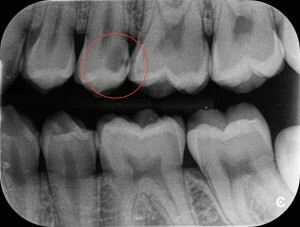 But if we look at the radiograph below, it tells a different story. If you look at the area encircled, you can see a dark shadow. This is decay. So while the tooth looks perfectly healthy from the outside, there is decay present under the enamel layer. This is a common pattern with decay. 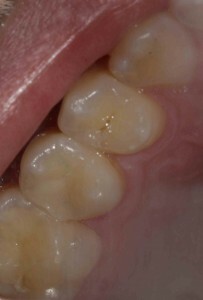 The layer below the enamel, dentine(think of it like an M&M, the hard shell is the enamel and the softer chocolate is the dentine)is broken down by the bacteria. Eventually the dentine will become so weak that it will no longer be able to support the enamel layer and the classic cavity or hole will appear in your mouth as the enamel caves in. 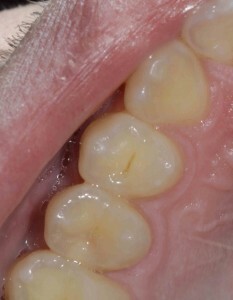 Have a look at the picture on the right with the decay cleaned out of the tooth. You can see that there is a very large hole left. 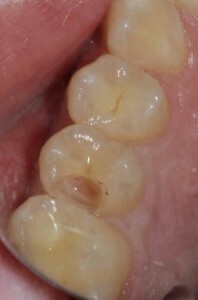 Thankfully for this patient the decay was found in time and I was able to restore the tooth with a white filling. Left unchecked this would certainly have developed into pain and the tooth would have needed either a root treatment or extraction adding significantly to the cost and distress for the patient.